World's Largest Ape Listed As Critically Endangered; Pandas Upgraded To 'Vulnerable' : The Two-Way Giant panda populations have risen, thanks to forest protections. But populations of Grauer's gorilla total only around 3,800 individuals — a 77 percent reduction — according to a recent survey. 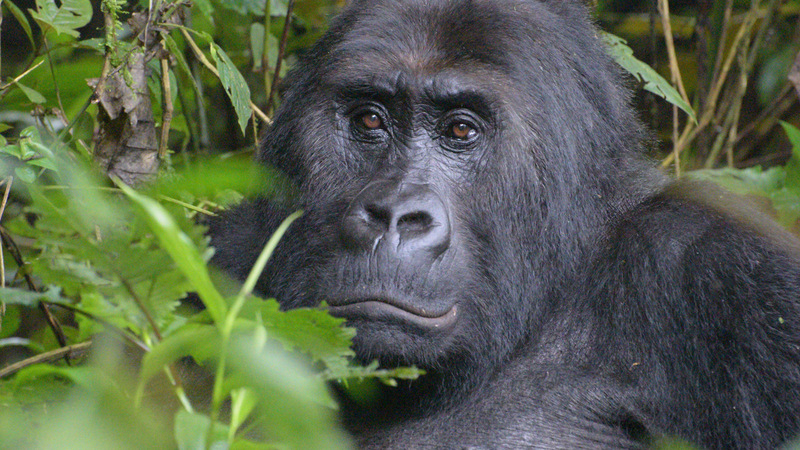 After a 77 percent population decline, the Grauer's gorilla is now on the critically endangered species list. A subspecies of eastern gorilla that lives in Democratic Republic of Congo now faces "an extremely high risk of extinction," wildlife experts say. Grauer's gorilla, the largest great ape in the world, is now listed as critically endangered on the International Union for Conservation of Nature's "red list" of threatened species. While noting that climate change is expected to eliminate more than a third of the panda's native bamboo habitat in the next 80 years, the International Union for Conservation of Nature said the animal's status has improved, thanks largely to forest protection and reforestation. "The improved status confirms that the Chinese government's efforts to conserve this species are effective," the IUCN noted, adding that conservation efforts must continue if recent gains are to be maintained. Populations of Grauer's gorilla (Gorilla beringei graueri — formerly known as the eastern lowland gorilla) totaled only around 3,800 individuals in a survey that was released this past spring — a 77 percent reduction in a single generation that easily exceeds the drop required to be deemed critically endangered. Humans are largely to blame for the animals' decline: Poaching, habitat loss, and civil unrest are three of the main threats the gorillas face, along with disease and climate change, according to the IUCN. Much of the illegal hunting has been linked to laborers at mines. 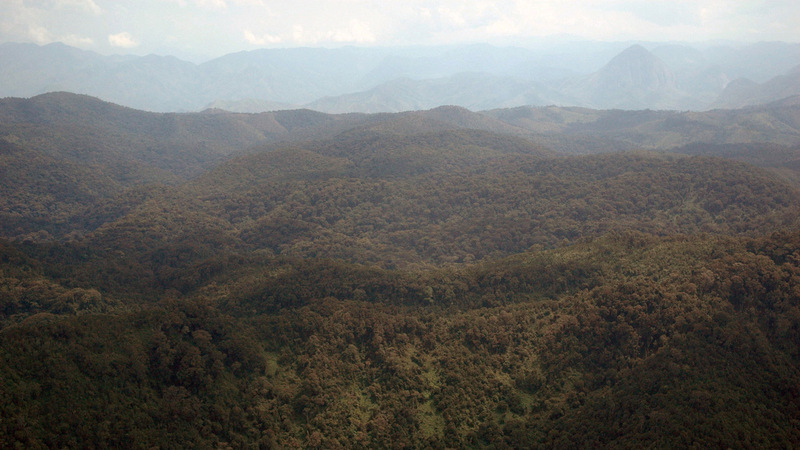 Kahuzi-Biega National Park is one of the last remaining strongholds of the Grauer's gorilla, the largest of the four gorilla subspecies. The formal change to the gorilla's status was announced Sunday at the IUCN World Conservation Congress that's being held in Hawaii. With the listing, both of the gorilla species (eastern and western) and all four subspecies are now considered critically endangered — one step away from being extinct in the wild. Andrew Plumptre of the Wildlife Conservation Society was the lead author of the revised listing. He welcomed today's move to acknowledge the gorilla's status, saying it might help it recover. "Critical Endangered status will raise the profile of this gorilla subspecies and bring attention to its plight," Plumptre said in a statement about the listing. "It has tended to be the neglected ape in Africa, despite being the largest ape in the World." The gorilla's current status is a stark downturn from just 20 years ago, when the total population was estimated to be 16,900 in the mid-1990s. Grauer's gorilla lives in fractured habitats in eastern Democratic Republic of Congo, including Kahuzi-Biega National Park and nearby forests, the Maiko National Park, Kisimba-Ikobo Nature Reserve, Tayna Nature Reserve and the Usala Forest. According to the IUCN, the gorillas eat a diet that's "rich in herbs, leaves, bark, lianas and vines," along with seasonal fruit, bamboo and insects. The sharp population decline had been suspected for years — the mountain gorilla, the other eastern subspecies, was listed as critically endangered back in 1996 — but it wasn't until this year that researchers were able to demonstrate the severity of Grauer's gorillas' collapse, using data from park rangers and from local communities that was integrated in software called SMART (the Spatial Monitoring And Reporting Tool).